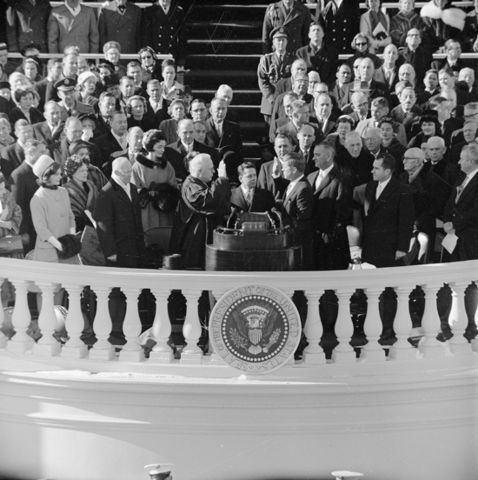 President John F. Kennedy asked Robert Frost to participate in his inauguration ceremony on January 20, 1961. Frost, the first poet ever to read a poem at a presidential inauguration, intended to deliver a seven line poem he wrote specifically for the occasion, Dedication , but lost his place (perhaps on purpose), so he began reciting this poem he'd committed to memory instead. It would be over thirty years until the next poetry recitation: Maya Angelou recited her poem, On the Pulse of the Morning , at President Bill Clinton's inauguration in 1993. Elizabeth Alexander recited her Praise Song for the Day at President Barack Obama's inaugural ceremony in 2008. Enjoy exploring our collection of 100 Great Poems. Add The Gift Outright to your own personal library.